Here is a question. Why do people always prefer wearing dark clothes in winter? Is it because they are worried light shade coat will get dirty faster? But what about trousers, dresses, shoes or knits? Why we can’t find a satisfactory selection in all shades of neutrals during the winter months? Buying a good quality beige or off white boots that would not cost an absolute fortune seems like impossible task. The same applies to coats. Of course, brands like Max Mara or Agnona, Loro Piana or any other high end brand have always great selection, but you will pay the price. But what about more affordable brands? Why do people wear dark colours in winter? The other day I was walking with my friend down the Kings road in London. It was a bit chilly, but not freezing, around 10C. I was wearing my beige coat and my friend a pink coat. We were the only ones in light colours in the sea of black and charcoal grey. Occasionally we could spot navy blue or burgundy red. It felt a bit sad. I get it, it is cold, you don’t feel like putting on bright colours. You just want to snuggle in your dark coat and feel like you fit the weather conditions. I also have a black coat, just one and one black cape. And I really like wearing them. However, over the years I am always trying to bring a bit of light into my winter wardrobe. 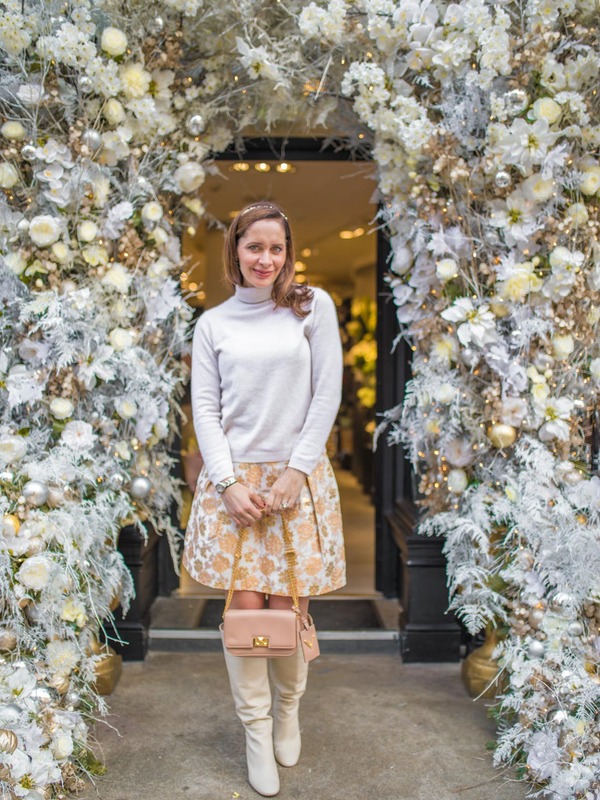 This season I love wearing all the shades of neutrals. My favourite is off white and light beige but any other neutral shades are great too. Just last week I bought two pairs of Zara boots, one in off white and exactly the same but in light beige. I was so pleased. It was the only brand I found so far (in Europe) that had light shades of neutrals boots and for a good price and good quality. I have included very similar off white boots into the collage. I also bought this checked wool scarf which goes really well with most of the coats. Every fall I am stocking up on cashmere jumpers and buy at least one high quality one. This year I am fell in love with this one but also like wearing off white sweaters from Uniqlo. On the pictures above I am wearing Tara Jarmon brocade gold and white skirt I bought few years back and Uniqlo sweater. I teamed the outfit with my off white Zara boots and Valentino bag. Here I am wearing Old England tartan skirt (similar here), wool checked scarf, Uniqlo wool merino sweater, Jaeger coat and Chanel bag. The sunglasses are by Quay Australia. But now back to you. 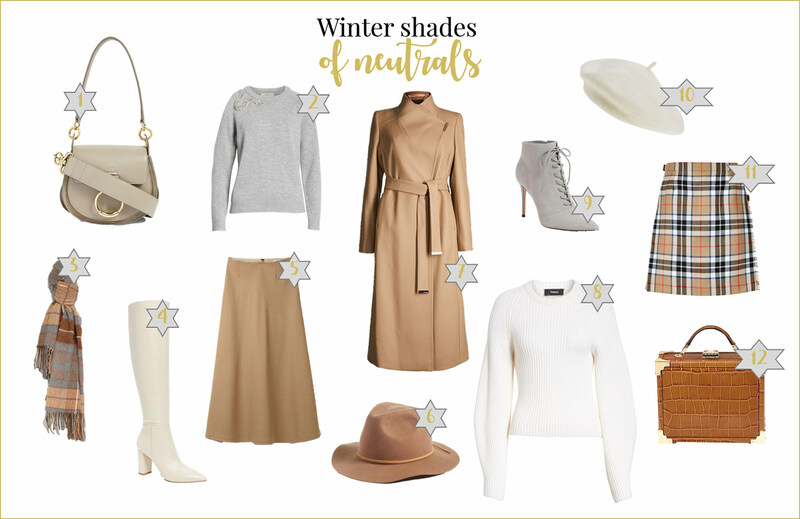 Do you wear neutral shades in winter or are you more of a dark colour girl? If you wear more dark colours, here is my list of reasons why it is good to wear light colours. One of my main reason is that shades of neutrals goes so well with most of the colours! Black, blue, pink, green, you name it. They are literally the easiest colours to style. I haven’t yet to see a person who wouldn’t look good in a shade of neutral, if chosen well. So it WILL suit YOU! Just choose the right tone for you. It is nice not to be in the black or dark colours all the throughout the whole winter. You will see that even just a change of colour palette can change your mood. Also, you will look more radiant and chic than in dark colours. You will stand out from the crowd.